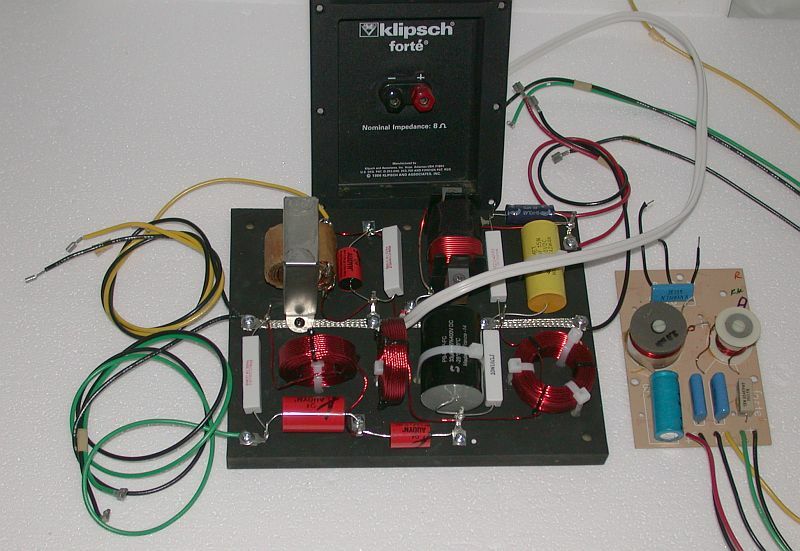 The original "ALK Universal" replacement crossover network for the Klipschorn, La Scala and Belle Klipsch as been reimplemented to create an affordable option for nearly any Klipsch based 3-way loudspeaker. High cost is no longer a reason to turn the clock on your Klipsch back to 1975 with a newly built A or AA "Clone" from other vendors, when you can turn it forward with a modern design! Now with an improved tweeter filter for a flatter response and a sharper skirt. 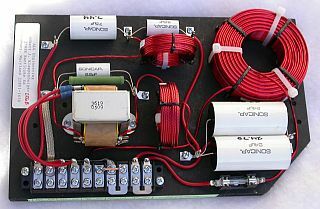 An economy network for almost any 3-way loudspeaker. An affordable no-compromise design built with no-nonsense parts including low loss Litz wire inductors and German Audyn Q4 polypropylene caps. Virtually the same design and sound quality as the original Universal network. Much research has been done to ensure that the parts chosen for this design are comparable to those with big price tags. If you want more performance, look at an advanced design such as the AP12-500 + ES5800 set. High priced parts do not always translate to better sound but a correct design will! A true 3-way network including a full crossover from squawker to tweeter at 4000, 5000 or 6000 Hz (bandpass) allowing the use of any quality squawker driver or the Klipsch K55. The low frequency crossover is 1st order at roughly 400 or 600 Hz. The actual crossover frequency is acoustic and determined by the woofer and squawker driver and horn making it truly "Universal". It is compatible with the stock Cornwall, Heresy or virtually any Cornscala configuration. Can be used in nearly all Klipsch based 3-way loudspeakers even those using wide range midrange drivers like the B&C DE85 at normal listening levels. Enlarge A specially designed autotransformer having low DC resistance (0.382 Ohms) and tight coupling provides taps to allow squawker level setting changes by the customer. The choices will be 1 to 18 dB in 1 dB steps, Attenuation is selected without soldering by push-on terminals and without cryptic setting tables. The attenuation settings are clearly written by each tap in dB units. The normal setting will be 6 dB. 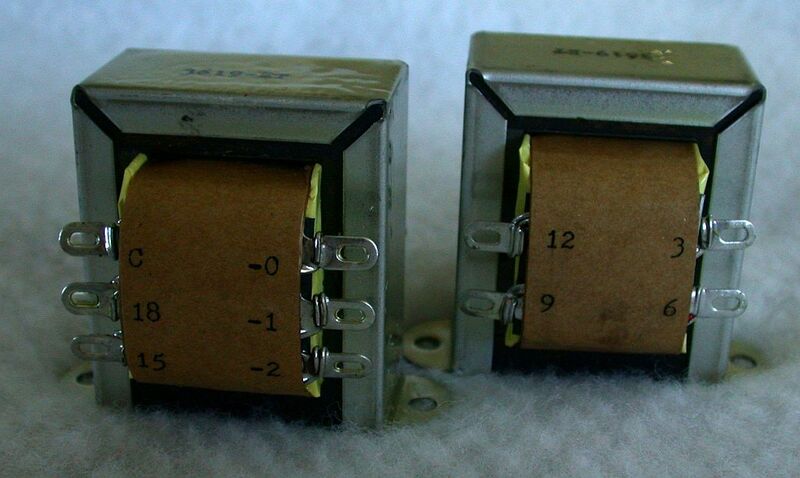 This adjustment will also allow the use of 8 or 16 Ohm squawker drivers without modification. NOTE: Any transformer that is larger in size is a waste of money. It will handle 50 Watts of power without batting and eyelash with virtually no loss, That is already extravagant considering the power levels through the midrange in a Klipsch loudspeaker will generally be less than ONE Watt! A stable 2, 4, 6 or 8 dB plug-selected	L-pad is included to adjust the tweeter level. Constant 6 to 8 Ohms resistive load impedance to the amplifier. All networks are built in matched sets. Shipping box: 15 x 12 x 10 Inch. Weight: 11 Lbs. 1-Why is this network called the "Universal"? 2-Can I change the woofer / squawker crossover up higher to allow me to replace the K55 driver with a better one since most will only go down to 500 or 800 Hz? The tap settings list for the original 3619 transformer can be downloaded here (Size: 48K). 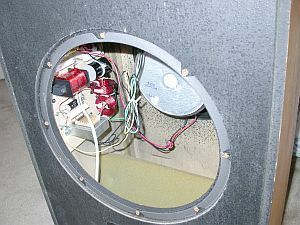 Titanium replacement diaphragms for the Forte tweeter are compatible with the Forte networks. ALK has no opinion about their value. It is your choice if you choose to install them. The transformer on the stock Forte crossovers will be reused on the new network. After the waiting period and construction of your new network is almost complete I will contact you to remove and return your old networks complete with all the attached cables. The transformer and cables will be removed and transferred to the new networks. This will reduce the time your speakers are out of operation to the time required for shipping. Recycling the transformer saves you $48 in part cost. There is no advantage to trying to save the old network. It becomes quite useless after the changes and will be thrown away.